Don’t look now, but harvest season is wrapping up and this year, like most in recent memory, has brought its fair share of unpredictability. As always, some areas fared better than others. Many farmers in the Northeast and Midwest were simply hoping for a late freeze to get their crops to maturity but got something even better in the form of a balmy September with temperatures that easily pushed the crop to the finish line. Here in the South, we have been at work since June chopping silage. The corn grain harvest just finished up before Hurricane Irma hit. Picking peanuts and cotton are now in full swing as I’m writing this. Most of our crops have been above average this year, but one factor has held several farms back, and that is fuel! This year, it’s not price or supply that’s been a problem but rather the quality and/or the lack of our engines to tolerate it. Lots of farmers and dealerships, including mine, have been fighting this battle for several years now, but as Tier 4 Final engine mandates roll out at the end of this calendar year, the fuel gremlins are rearing their ugly heads. We have seen a slight uptick in used equipment values this year. Most of the stronger prices didn’t occur with the nice, late-model, low-hour units, but rather with the more aged, Tier 3 engine units that are older than seven years. This just drives home the fact that some farmers would still prefer simple rather than complicated and familiar rather than cutting-edge technology. It is common practice at our dealership to change all fuel filters on new machines in the first 30 hours of operation and some before then. The tiny bit of diesel in a new plastic tank off the assembly line can sometimes contain small particles that can potentially cause fuel system problems. We have even gone so far as changing filters every 10 hours to head off any problems. New or not, routine changing of fuel filters is a cheap and effective means of keeping your engine operating at peak performance. As choppers, balers, and tractors begin to finish up this fall, make sure that you change not only the engine fuel filter, but also the filter on your diesel storage tanks, or add a filtering system to your pump if you don’t already have one. We had several customers experience injector problems this summer, and these involved several different colors of tractors ranging from new to old. When this happens, be aware that some manufacturers will be asking for fuel samples. We’ve also seen problems with filters, injectors, metering valves, high pressure pumps, and fuel lines that have caused more than the usual number of issues this year with late-model equipment. Though you can’t always control how “clean” your incoming fuel supply might be, you can eliminate a lot of fuel-related problems by filtering the fuel at several points before it reaches the injectors. Stock up on fuel filters at your shop because no one is immune to fuel-related breakdowns. For those with tractors or other self-propelled machines that are still under warranty, make sure you purchase filters that are approved by the machine manufacturer. Choosing a “bargain” brand may turn out not to be such a bargain if problems occur. Often, major manufacturers put maintenance items such as fuel filters on sale during the off-season. Fill your shop shelves and take advantage of these savings. Biodiesel is widely used in Europe, and now some U.S. states are starting to mandate higher percentages for fuel being sold. This will be a great thing for the agriculture industry in general but I believe will probably lead to a few fuel-related consequences and some needed adjustments along the way. Make no mistake about it, biofuels are here to stay and it appears that engine emission rules will be as well. I sometimes get asked if fuel additives are a good investment. 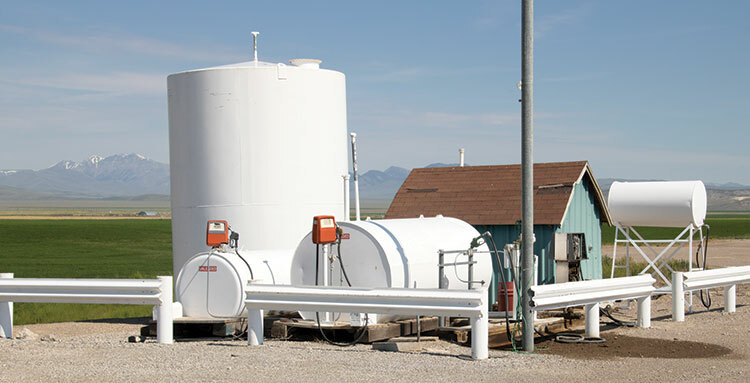 Some people have gone to using additives in their bulk tanks or with each fill-up. Some are extremely effective, but take caution as some do not mix well with others. Certain additives can impact the lubricity of the fuel itself and cause your engine to run irregular. The only way to fix such a problem is to drain your fuel tank. That would definitely not be on my top 10 favorite things to do. Do your homework on fuel additives before you purchase and use them. Diesel fuel quality will be a battle that will be ongoing as engine manufacturers and fuel companies try to keep up with emission regulations. All we can hope for as farmers is that they work together and test both engines and fuel together. The situation is always changing; seemingly, by the day. Hopefully, we can start to see some light at the end of the fuel tunnel where all fuels and engines play nicely together, but for now that fuel picture is pretty dirty! This article appeared in the November 2017 issue of Hay & Forage Grower on page 40.